Many years ago Frank Sawyer designed his Pheasant Tail Nymph (See the September 1998 Fly of the Month by Jim Abbs). Now we are putting beads on them. The bead head fly craze really started at the 1988 Dutch FlyFair (a mini conclave). However, prior to 1991 we Americans didn't listen to the European fly fishermen (See March, 2000 Fly of the Month). At the FFF 1991 International Conclave in West Yellowstone, Montana, Dutch fly tier Theo Bakelaar made an impression on everybody. After all, he was clad in a gold suit with gold paint on his face and a passion for bead-head, bead-body and bead-etc. flies. Three of his flies are shown in Patterns of the Masters 1991 Conclave. FFF officials, mainly Jack Parker, took him fishing and saw how effective his flies were. In 1992 everybody wanted bead head flies, and most of our beads came from craft shops. The demand was insatiable. Commercial tiers tied hundreds of dozens, and even guides stayed up late to tie bead head patterns for their clients. Most tied single bead head patterns like above. However, John Faust of Hamilton, Montana made it better by including two beads (see two bead fly above). His pattern also has the advantage of using beads with holes that are too large and would slip over the hook's eye. In stillwater use bead patterns with floating or sinking lines. With a sinking line let the line and fly sink to where the fish are and start to retrieve. 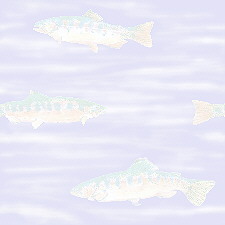 The fish are frequently near the bottom, but they might not be there. Also, vary the retrieve until something works. With floating lines vary the fly sink-time and retrieve. Start a hand twist retrieve immediately, let the fly sink to near the bottom before retrieving, or even let the fly hang under a strike indicator. The keyword is experiment. Bead patterns also work well in moving water. Suspend the fly under the strike indicator a distance about equal to twice the water depth. In fast water extra weight might be needed a foot or two above the fly to sink everything quickly. If the indicator does anything beside drift downstream. It might be only a rock or it could be a nice fish. Then you will have a great story to tell your fishing partners. 1. Smash the barb to make threading easier, and slip on one or two brass beads. If you have modern beads with a smaller hole on one side put it toward the eye. 2. Put hook in the vise with the shank pointing down a little so bead stays at the eye. 5. Hold up butts of pheasant tail fibers and wind thread forward to a little in front of mid shank. 6. Grasp the pheasant tail fibers with your fingers and start wrapping them around the shank. The first wrap should be back to cover the thread wraps securing the fibers, and then wrap forward to mid-shank, secure and trim excess. 7. Spiral the copper wire rib forward in the opposite direction than you wrapped the pheasant tail fibers. This counter wrapping protects the pheasant tail fibers. Secure and cut off excess wire. Leave thread at front of body. 8. Cut off a dozen or so tail fibers after making them even. Measure the tail fibers so the distance from the tips to the thread is about twice the mid-shank-to-bead length. Secure them on top of the hook with tips to rear. Wrap thread over butts to help build up the thorax area. Trim excess. 9. Secure two or three peacock herls by their tips between the body and the bead. Wind thread to bead. Build up a fat thorax by winding herls between body and bead. Secure and trim excess. 10. Pull the wingcase fibers forward, hold them together and secure with a turn or two of thread. 11. Divide the tips, and hold half of them along each side of the thorax. Put on a couple more thread wraps to hold tips back, whip finish behind bead and add a drop of head cement to wraps. Steps 1 to 6 same as above except secure pheasant tail fibers from body on top of hook and do not trim excess. 7. Spiral gold wire forward. Faust likes to wrap the rib in the same direction as the body is wrapped but with a different pitch. He feels that body fibers are loosen with counter wrapping. Hold up excess pheasant tail fibers, put several wire wraps ahead of body, secure with thread and trim excess wire. 8. Bring one bead back to body, and move thread to front of it. Even the tips of 6 or 8 pheasant tail fibers, cut them from tail feather and tie them, tips to rear, on top of hook in front of rearmost bead. Make these legs 1-1/2 to 2 gap widths long and split half on each side of bead. Trim excess. Bring pheasant tail fibers from body over bead forcing legs to side, tie down and do not trim. 9. Bring front bead back and move thread in front of it. Tie on 6 or 8 pheasant tail fibers for the front legs. Trim excess. Bring pheasant tail fibers from body over beads, forcing legs to side, and secure near the eye. 10. Trim excess pheasant tail fibers and whip finish head. Add a little head cement to whip finish and wingcase. As far as I am concerned any style pheasant tail nymph is a great all year fly. Have fun with these patterns. Please put the fish back gently so you and others can have the pleasure of playing with them again. Many Thanks to FFF Club and Bob Bates.